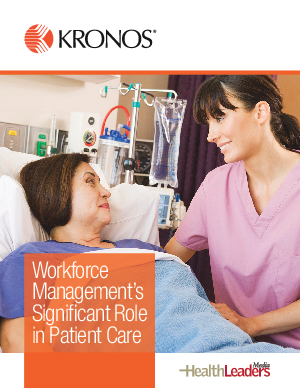 White Paper Published By: Kronos, Inc.
As the healthcare industry shifts focus from volume to value, standardization is needed to accurately benchmark labor resource utilization. This is the premise of a survey conducted by HealthLeaders Media and sponsored by Kronos. What constitutes direct patient care? Hands-on patient assessment, administering medications, and performing procedures clearly top the list. But can other activities be considered direct care too—even those not conducted in a patient’s presence? For healthcare systems trying to benchmark the impact of staffing on clinical outcomes and patient satisfaction, these are important questions. Download the free report to get statistics and analysis from the survey questions below and much more! Which of the following actions are considered direct patient care in your organization? Which of the following actions are considered indirect patient care in your organization? Which of the following actions are considered neither direct nor indirect care but are categorized separately as non-patient care in your organization?